Lately, I'm seeing things about my skin that I've never seen before. I thought it was because I've experienced a few more years than some of you. But then I began to talk with other women, of all ages I might add, and it seems as though we're experiencing the same things. 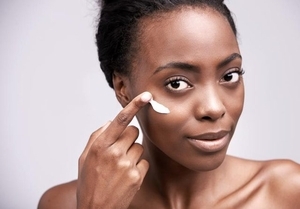 African American Skin Care - Dark Circles and Fine Lines Under Your Eyes? One woman couldn't understand why she'd gotten such dark circles overnight. Her dark circles were an easy fix, she'd gone to bed with mascara on. Not intentionally, she'd washed her face but didn't get all of the product off her lashes. She explained how tired she was from working longer hours than usual at her job. What if the dark circles you experience are not from mascara and are the result of fatigue and lack of sleep? What if your dark circles are the result of the skin under your eyes becoming drier? What if it's genetic? The skin under your eye is very thin, fragile and sensitive. Yet this is where the greatest amount of attention is given when adding color to your face. Think about it! We add color with shadows, liners and mascaras. We even add lashes to our lashes. Granted some of you can't do all of those things and neither can I. The minute I put on mascara my eyes begin to water and I'll look like a raccoon the rest of the day. I've tried them all. I keep my under eye area moisturized with my eye revitalizer cream. I use a dab under my eyes. This also takes care of fines lines that have introduced themselves to the area around my eyes. Do you love the skin you're in? Have you asked yourself this question? I asked and the answer I got was: until you see a zit. As soon as a pimple appears, you know that nine out of ten times a dark spot is soon to follow. That's because of your gift known as Melanin. Melanin protects your skin from many challenges but it's also the cause of many of your skin challenges. Many of you feel that you can spend time in the sun because your melanin will protect you. You can stay in the sun longer than others but you too might want to limit your time in the sun. As African American men and women, we possess the beauty of many shades and degrees of dark skin. As such, the lighter you are on the scale the more prone you might be to freckles, dark spots and sunburn. To my beautiful black skinned family on the darker end of the spectrum, you too are subject to sunburn and dark spots. You just wont see it as soon and this could present more of a problem for you. The key in caring for your beautiful black skin, is to get your necessary sun exposure but in moderation. And if you must be out in the fullness of the sun's light, wear a hat with a brim to shield your face and don't forget your sunscreen.